I need to admit something to all of you: I’m in a mixed relationship. 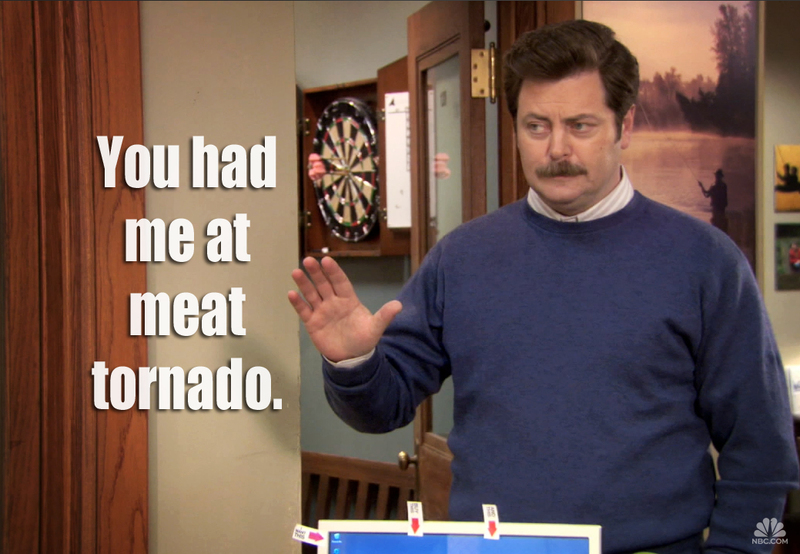 You see… sometimes, I eat meat. My partner… well, he’s a lifelong vegetarian. I’ve dabbled in vegetarianism for years, sometimes for ethical reasons, more often for health reasons. Most days, I prefer getting my protein from plant-based sources, finding I feel healthier on days my stomach isn’t weighed down with animal parts. And then, about once a year, I have a Ron Swanson-level squee-fest over the mere idea of a steak. Thanks http://nbcparksandrec.tumblr.com/ for the perfect visual. This preference toward vegetarianism is on a moving spectrum, from complete vegetarianism in high school to having chicken and turkey in the house during most of grad school. The last year or two has been mostly a “I don’t have meat in the house, but sometimes I eat it out” sort of situation. So where’s my “so what?’ of this post? Let me tell you a story. As of today, I’ve been living in California for a month. San Jose, to be specific. And I’ve noticed a few differences between my current home and where I live 9 months out of the year: gas and groceries are way higher priced, diversity is actually a thing here, annnd there are usually way more vegetarian items on a menu (complete with being able to eat my body weight in avocado – yay!). While I may not be ethically/religiously vegetarian, my partner is. So while I honestly will eat whatever you put in front of me (including hákarl with a brennivín chaser while attending a conference in Iceland), I’ve learned to be more mindful of scouting out vegetarian options (don’t even get me started on being on the lookout for hidden gelatin and chicken broth…) when we go out. And we’ve had some pretty good food the last month. By far, my favorite find has been the Haute Enchilada in Moss Landing, whose vegetarian/vegan and seafood options are truly top-notch. But lately, I’ve been noticing a trend when we order food. I do say trend, as at this point, it’s happened multiple times. The first couple times, I chalked it up to the server mixing up seats on an order. Or the fact that often, a second person (not our server) would bring our food to the table. No big deal. But then it kept happening. The most recent example was when we went out for pho on Saturday. We’ve found a lovely place near us that does a decent vegetarian pho, which I’d ordered the first time we went. But this time, I was feeling seafood. I’m from the Chesapeake. For me, seafood is generally always going to win over a vegetarian option. So we’re sitting there, munching on vegetarian spring rolls when our food comes out. The gentleman carrying our food announces “vegetarian?” and before we can answer begins putting it down in front of me. Actually, no, thank you, that delicious bowl of seafood is mine, thanks. given my partner’s height, people assume that he can’t be vegetarian. This second option has actually come up repeatedly. People legitimately think that if you’re tall, you must eat meat. 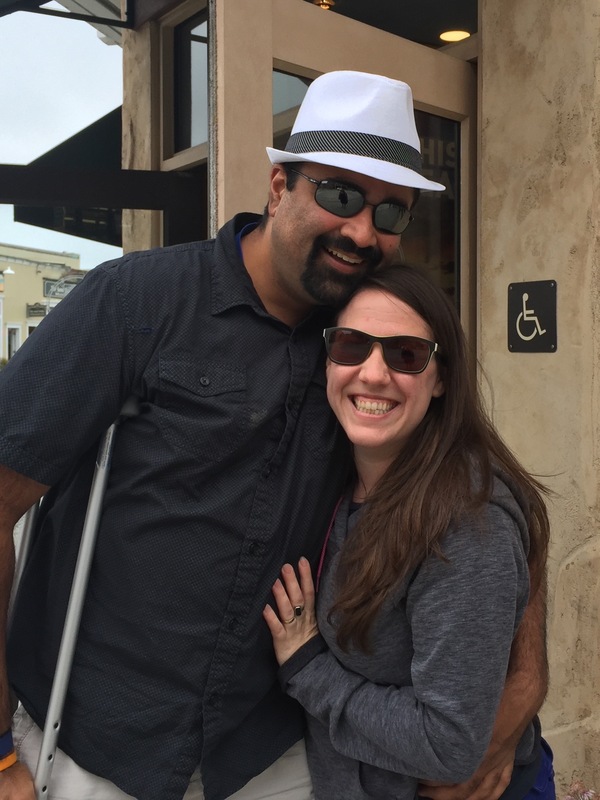 When visiting family in India, people actually vocalized on several occasions that my partner must eat meat in America because there’s no way he could be that tall otherwise. If I really wanted to make this article even more confusing, I could add in an entire side adventure about misconceptions in the West about Indians and vegetarianism. But it seems that conceptions about size, masculinity, and vegetarianism, at least with what I have encountered, trump the “all Indians are vegetarians” myth (though you would think the conflicting perceptions would at least make servers pause before automatically plunking down a bowl of veggies in front of me). I’m laughing to myself as I sit here thinking about all of this–in California. In the Bay Area. You know, the part of the US that all of us East Coast snobs refer to as “crunchy,” “granola,” “organic,” and high on its own smug (thanks Matt and Trey). If any place were going to be openminded about vegetarianism, this would be it, right?? The good news is, through all of this, I’m having to rethink my preconceptions about living on the West Coast. Yeah, there might be more vegetarian options (and yes, the aforementioned avocado comment is real – you really can get avocado added to anything) out here on the Left Coast, but male vegetarians still confuse people (apparently). Despite the health benefits and Whalen’s decided push for such a diet, being a vegan is not the most popular move to make in the NFL. The few other players who have professed plant-only diets have riled up fans, media pundits and even teammates. They’ll ruin the team’s chances of a winning season. They’ll be weaker on the field. They’ll get tackled and outplayed more easily. Meat is a must for the NFL. Protein. Manly food. To eat plants-only is foolish for a football player. So yeah, there definitely seems to still be a misconception here about size, strength, and the health benefits of a vegetarian/vegan diet. And of course, we can debate all day about size, strength, and whether or not vegetarianism affects either. 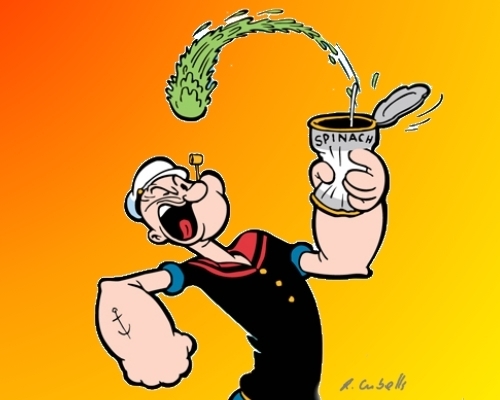 But the bias really seems to be clearly on the side of “of course you can’t be big and strong only eating plants.” Unless, of course, you’re Popeye. So does what I’ve been witnessing at restaurants really come down to this continued belief? Does it really just come down to the 15-inch height difference between myself and my partner? And then I chow down on the souls of recently departed shellfish, preferably slathered with all the avocado the kitchen has.